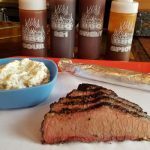 Bad Brads BBQ Orion Twp review, pics, hours, and menu info. 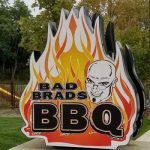 Bad Brads popularity is increasing and they added a long-awaited Oakland County location to their stable of Metro Detroit BBQ restaurants. We first became aware of Bad Brads over 5 years ago when the Shelby Twp location (review) became quite the buzz. Somehow they snuck in the Orion Twp, Oakland County location under our noses and we couldn’t wait to review it once we (FINALLY) found out about it. 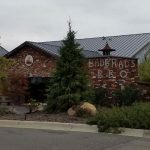 Bad Brads not a walk-up ordering BBQ joint, it’s BBQ gone (almost) high-end and reminds me a lot of the Oakland County gold standard for quality BBQ – Union Woodshop. 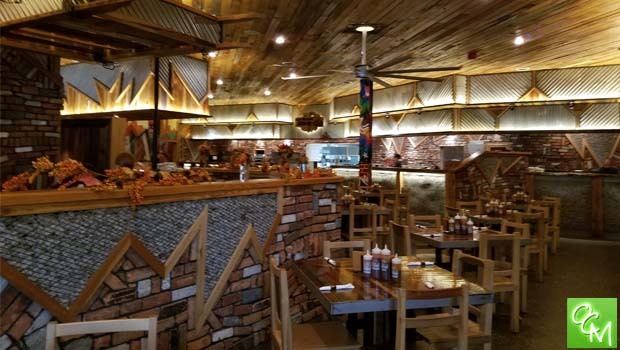 Union Woodshop and Bad Brads (and Lockhart’s Lake Orion) is where you can enjoy great BBQ with extensive menus, fully-loaded bars, and creative chef specialties in a cozy, mature setting. 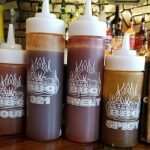 Bad Brads BBQ might be the most complete BBQ restaurant in Oakland County. When I say complete, I mean that they offer amenities other BBQ restaurants can’t match. 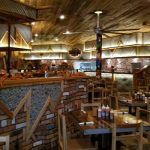 They use their expansive location to give customers a BBQ experience most other restaurants can’t. They went all out creating an enormous patio (complete with a fireplace and waterfalls), huge open dining room, full bar, and plenty of space to stretch out. It’s an impressive looking place, I don’t think they spared a single expense. These pics don’t do it justice. Menu options at Bad Brads BBQ Orion are as vast as the restaurant location itself. More than 10 apps to choose from, I highly recommend Pig Candy (bacon with cane sugar & chipotle). The bartender estimated she gained 15 lbs working at Bad Brads from her Pig Candy addiction. Bad Brads has more than 10 sandwiches. You can even get 6 different varieties of sliders. Of course, you can get your BBQ meats in 1-meat to 4-meat platter options with numerous sides (more than 15!) to choose from. Bad Brads serves half-slab & full slab St Louis style ribs. Or, you can always order a 1/2 chicken slow smoked. In addition the “usual” BBQ items, you can get entrees of steak, salmon, fish & chips, fried chicken… even a pizza. There’s literally something for everyone. Whatever you order at Bad Brads, it becomes even tastier with their 3 2 1 sauce. 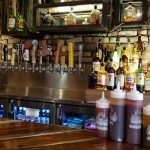 Bad Brads BBQ Orion Twp Bottom Line – Fantastic food and an incredible amount of menu choices. Great location for dine-in and for large groups. Expensive (for BBQ) but you get what you pay for. High-end BBQ done right and food is every bit as good as Lockhart’s Lake Orion & Union Woodshop (Clarkston). If I’m nitpicking I’d say I would have preferred more choices of sauces – The Shelby Twp location I reviewed had 7… but I’m not sure if that’s just regional or I didn’t look hard enough (or they cut their sauce stable to 4). Also, I’d love to have drinks & late night apps at Bad Brads… but they close pretty early – 10p on Fridays & Saturdays.